Working with students in your classroom who do not speak English as their first language does not necessarily require you to craft entirely different lesson plans than those used with English-speaking students; instead, you need to know how to adapt materials for the ESL student. Students who speak other languages are just as capable of participating in the activities and completing the tasks as the students who do have English as their first language. In fact, based on their culture or personal history, some of them might be able to understand the concepts more clearly. For ESL students it's not the subject matter or ideas they cannot learn or understand; they are on the same page and have the same challenges learning content as the native English speaking students. For ESL students it's the language in which the subject matter is being presented that can impede their understanding. If this is your first time teaching ESL students, you might be a bit unclear on what their educational challenges are within the classroom. Understanding that their comprehension levels of the actual material don't necessarily differ from that of your other students is key. Just because they are having trouble verbalizing a concept or answer, doesn't mean that they don't understand the material. If you are teaching biology, ESL students may have no trouble understanding the elements of different ecosystems or how cells in the human body are structured. However, they may struggle with the vocabulary. If they don't know what the English words "humid" and "blood" mean, for example, then the two previously mentioned lessons become rather difficult for them to grasp. You need to include the new vocabulary as part of the lesson. Implementing strategies to simplify the language you use, to teach vocabulary and to get everyone on the same page are necessities for all of your students. You can successfully teach a lesson to the entire class - both native speaking and ESL student; but you may need to adapt your lesson materials for the ESL student. The following strategies will help you be more efficient in presenting information to the ESL student, without breaking up the flow of instruction for the rest of the class. When you are starting on a new concept, use language that is easy for everyone to understand. Bringing in colloquialisms and jargon is not only detrimental for the ESL students in your class, but it can be confusing for other learners as well. If you are able to get everyone on the same page with the language, you can optimize your chances of educational success for all of your students, both native speaking and ESL speaking. For example, if you are going to teach students about the different genres of literature, be clear, specific and concise in your language. Saying "Three genres of literature are novels, poems, and plays" could be confusing. Instead, break the information into smaller pieces and multiple sentences by saying "Types of literature are called genres. Three types, or genres, are novels, poems, and plays." At the start of a new lesson, reviewing the vocabulary associated with the lesson first is a smart idea. You may wish to provide specific vocabulary lists to the ESL students in your class with words that they tend to stumble over. While you probably don't logistically have the time to spend many class periods on vocabulary, dedicating at least a portion of each session to review the words and use them will pay off in understanding for all of your students, and will give your ESL students the little boost they need to understand words that they may have never heard before. You can build vocabulary lists here on YourDictionary and make links to the lists available for all of your students and their parents. This will give them some words to practice before your next class session. No matter how dedicated you are to helping the ESL students in your class by avoiding idiomatic expressions and cliches, they tend to weave their way into every day speech and even into the culture of the United States. If you completely obliterate them from your classroom, then you are, essentially, doing a disservice to your ESL students. In order to understand what people in society are saying, they should learn some of these phrases. You might want to try bringing in one phrase per week. Use the phrase frequently during the week so that the student can see its use in various contexts. Write the phrase on the blackboard and leave it there during the week for student reference. You could ask students to illustrate what the phrase means. With younger student this could be done by drawing. Classes with older students can be broken into small groups to discuss and use the phrase as part of a planned activitity. The ESL student will often need extra help to understand a specific concept. You, or another student, can provide help during class when you identify that the ESL student is having a problem. This can create a real win-win: The ESL student learns the concept and the native speaker is encouraged to show what they have learned. You can provide help after a specific class. You can host review sessions after school. At the college level, you can suggest that students work with an ESL student at the writing center or lab. The goal here is to ensure that the ESL students do not feel alienated and that they understand additional support is available both inside and outside of classroom hours. "How to Adapt Materials for the ESL Student." YourDictionary, n.d. Web. 22 April 2019. <https://esl.yourdictionary.com/esl/esl-lessons-and-materials/how-to-adapt-materials-for-the-esl-student.html>. Working with students in your classroom who do not speak English as their first language does not necessarily require you to craft entirely different lesson plans than those used with English-speaking students; instead, you need to know how to adapt materials for the ESL student.Students who speak other languages are just as capable of participating in the activities and completing the tasks as the students who do have English as their first language. 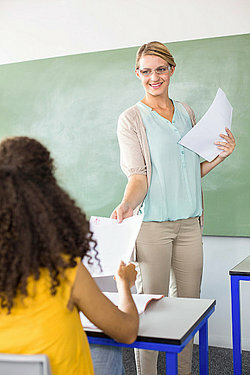 In fact, based on their culture or personal history, some of them might be able to understand the concepts more clearly.For ESL students it's not the subject matter or ideas they cannot learn or understand; they are on the same page and have the same challenges learning content as the native English speaking students. For ESL students it's the language in which the subject matter is being presented that can impede their understanding.